Apr 30 2015: Culture Junkie and Yugo Girl Ride the Swamp! 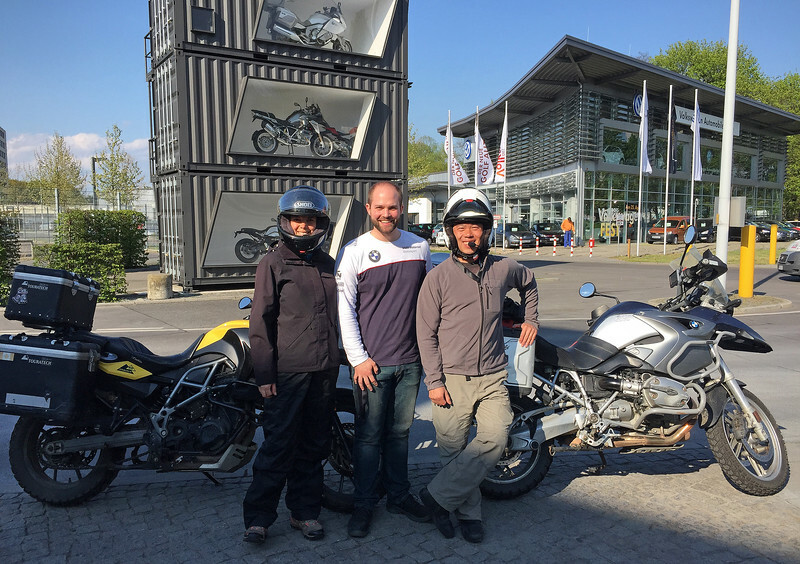 Just a three-hour ride north of us lies Berlin, which has been on both of our bucket lists for a long time. The city holds a special attraction for Neda and I for different reasons. 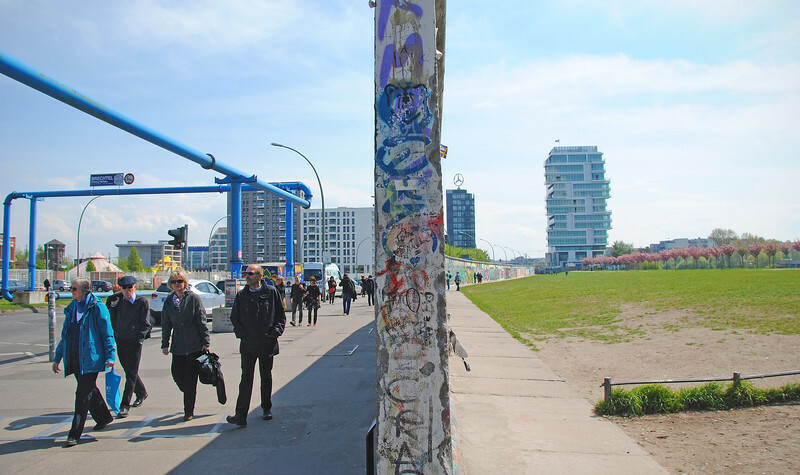 I remember watching the Berlin Wall fall on TV in 1989. It happened right about the time that the self-absorption of my youth was also falling away and I was becoming more aware of the world outside of me. Even at that age I understood the significance of that event. 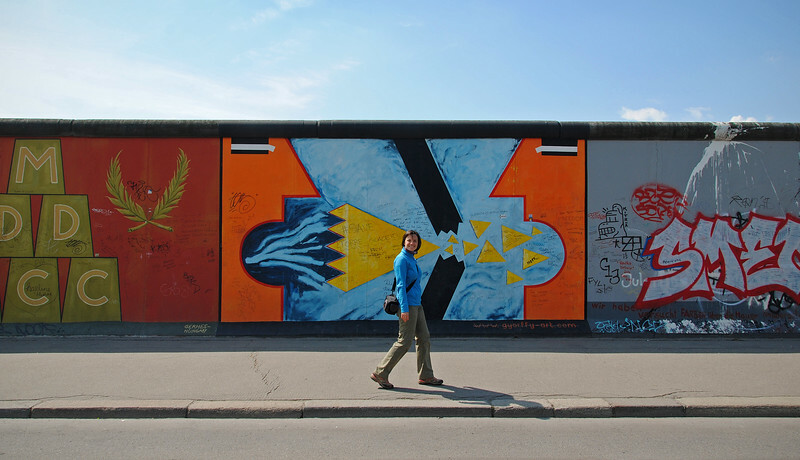 But really, Berlin interested me because that's where U2 recorded their Achtung Baby! album shortly after the wall fell. They were my favorite band at the time and their last album was a critical disaster. 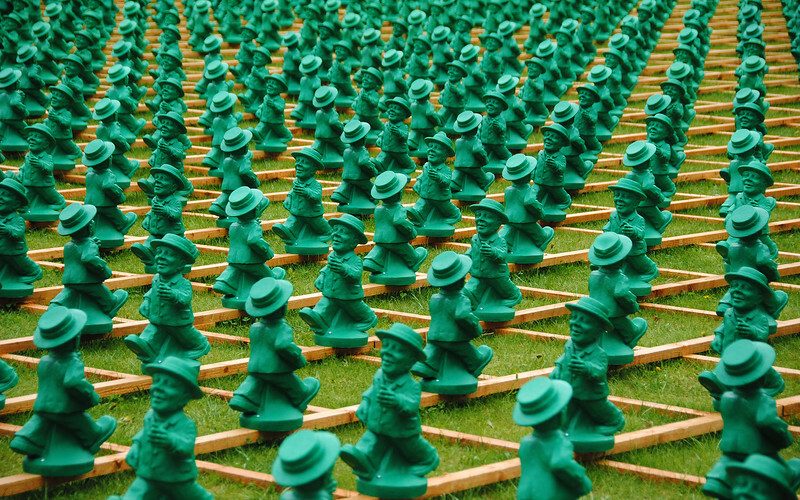 They traveled to this German city that was in the midst of reinventing itself to perhaps catch a bit of its zeitgeist. When Achtung Baby! came out I didn't stop playing it for months. 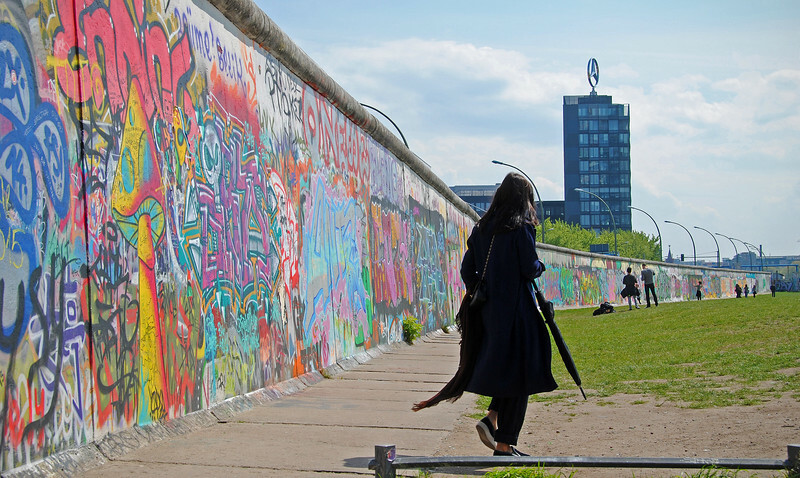 It was such a departure from their old sound, I often wondered what they found in post-Wall Berlin that transformed and rejuvenated them. 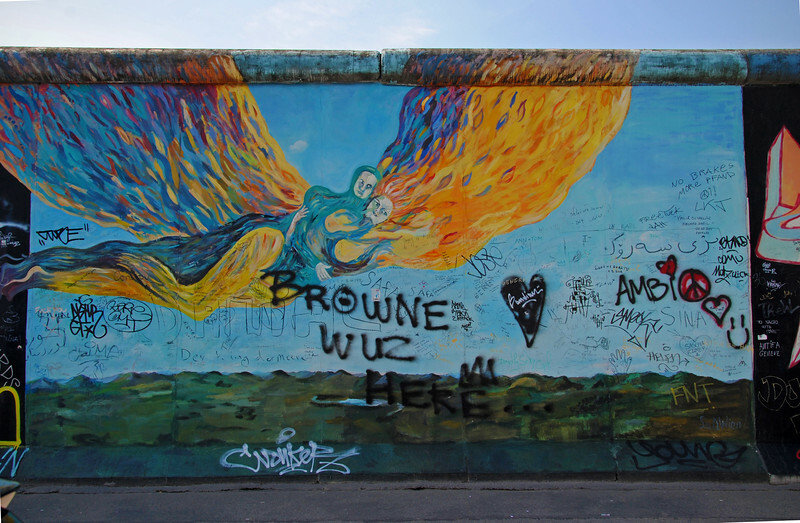 After the wall fell, Berlin also underwent it's own transformation. 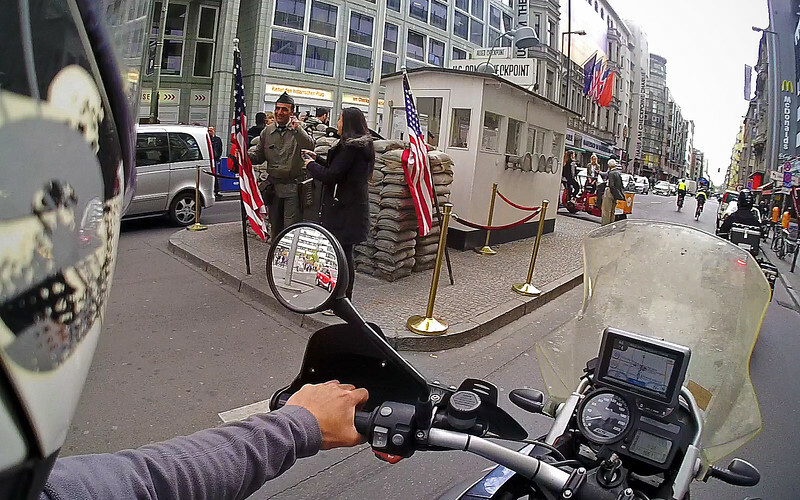 During the Cold War, Checkpoint Charlie was one of the most well-known border crossings between East and West Germany. Over time, the Eastern side of the checkpoint became more and more heavily secured with barricades and watchtowers. By contrast, the Allies continued to keep the simple shed that still stands to this day as a monument of sorts. 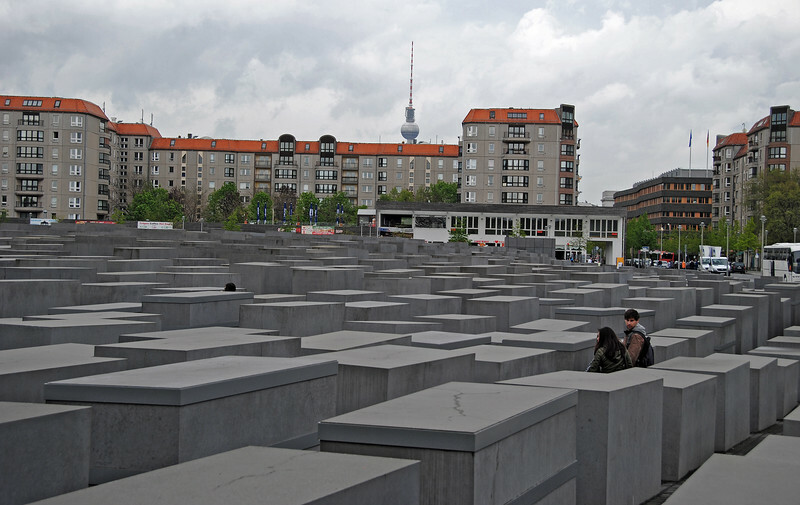 However, as we rode by it, the shed is now engulfed by modern-day Berlin. Busy buildings full of shops and stores and office buildings surround it and the road that once funneled soldiers, spies and defectors across the border is now one of Berlin's busiest intersections. Very cool riding past it though! 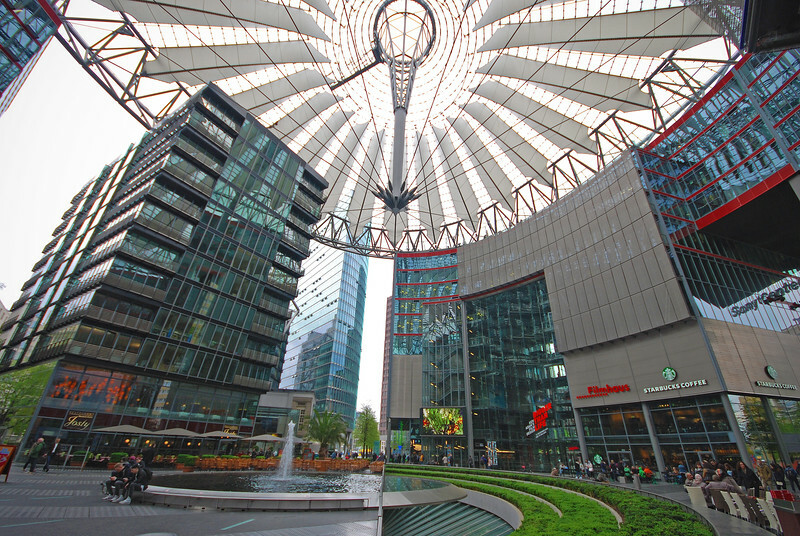 Berlin is so shiny and brand new. 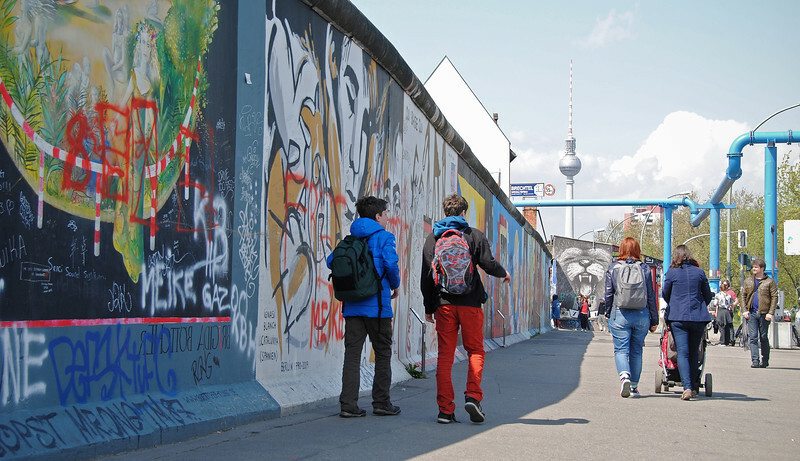 It's incongruous with the Berlin I had remembered from my youth: the old-world grey communist society peering enviously at the west through breaks in the wall. Of course the city had changed, it's been over 25 years since the wall fell. 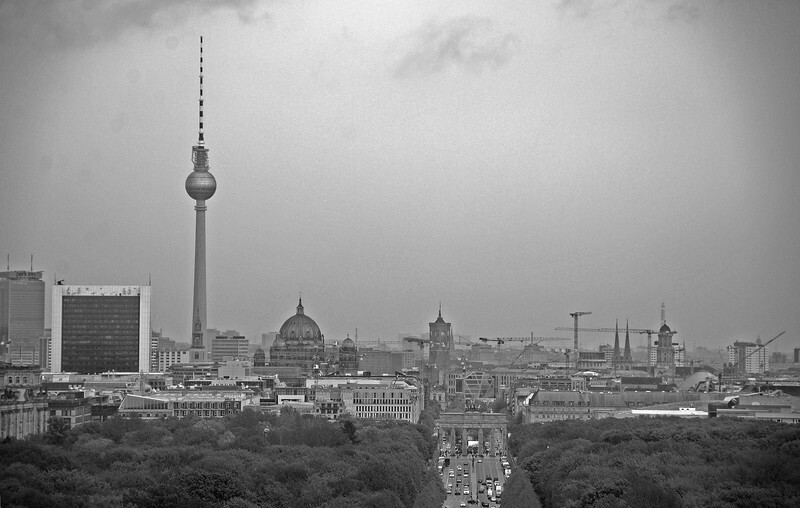 We went searching for the Berlin I remembered. Fortunately the one thing I could count on was that the RideDOT.com rains had followed us and I was able to take some photos of old monuments in the rain that approximated what I remembered of Berlin circa 1989. This street was in the U2 video "Stay (Far Away, So Close)"
Right about the time the wall fell, I also got interested in artsy foreign films. 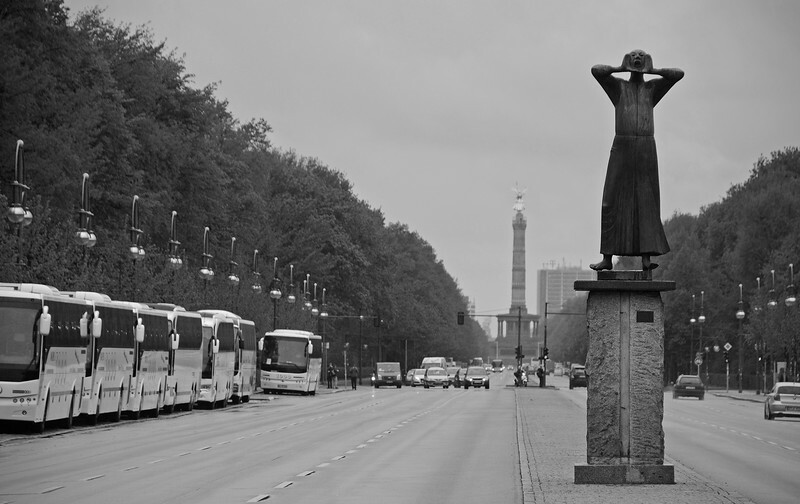 One that really stood out for me was "Der Himmel Uber Berlin" which was a fantastic allegory of the relationship between East and West Berlin. 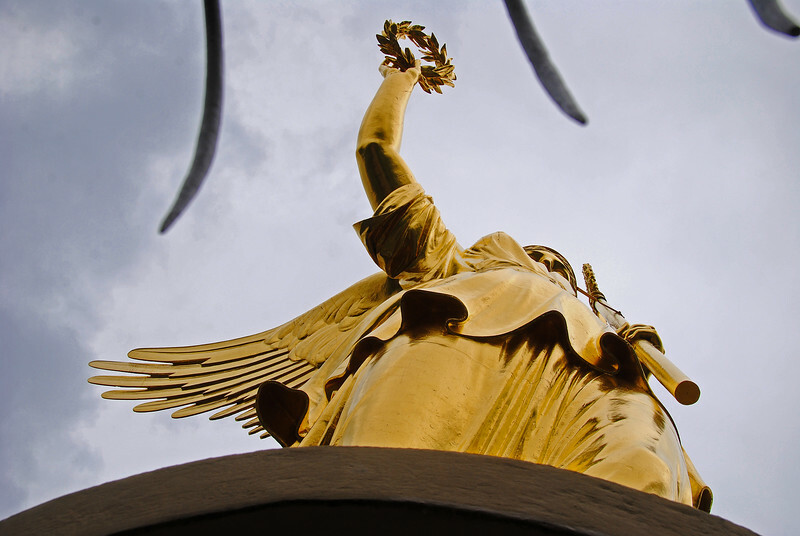 It was made two years before the Berlin Wall crumbled and in the movie, the East Germans were cast in the role of angels, who were unseen by the mortals (West Germans) although their presence was felt. The film was about one angel's desire to become mortal and fall in love, and experience things like hunger, humour, music and art. It followed his journey to break through the wall separating angels and humans. 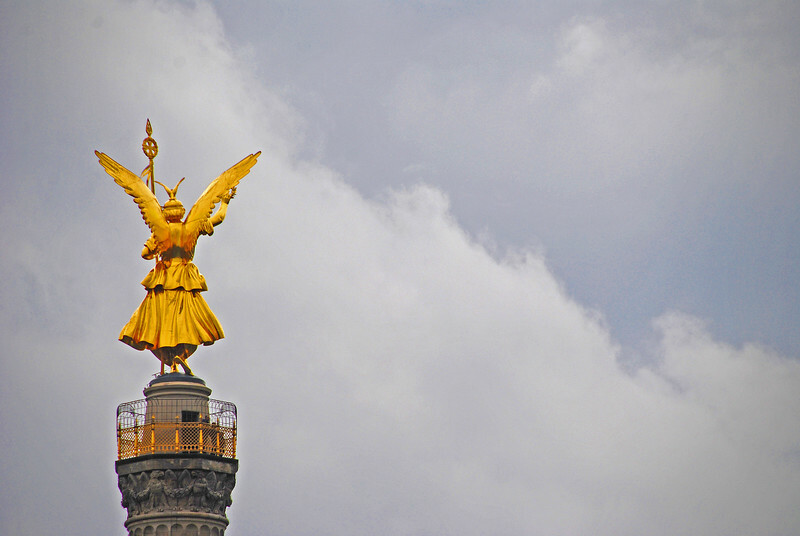 Anyway, the Victory Column figured prominently in the movie, being the perch from which one of the angels peers over Berlin and the mortal world. Because it was filmed in black and white, I had no idea the statue was such a brilliant gold. So I had to leave these pictures in colour. Another thing the movie didn't show was this cool art installation in the tunnels under the column. 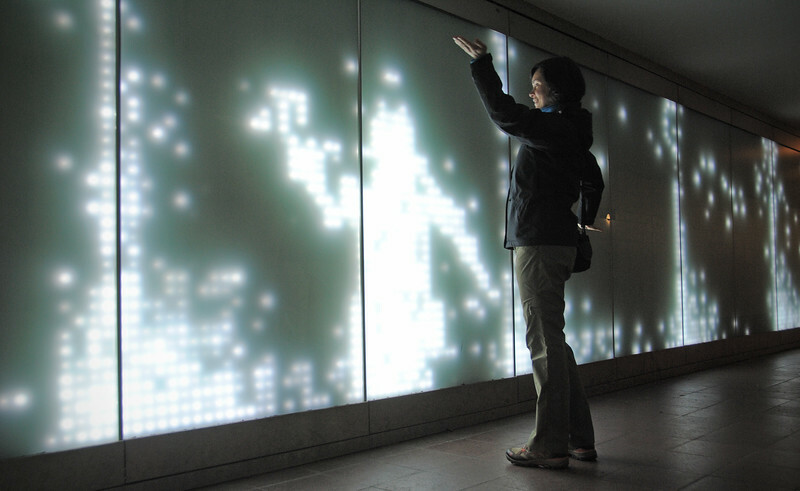 Cameras record your silhouette and recreate it in pixels in front of you. Cool! 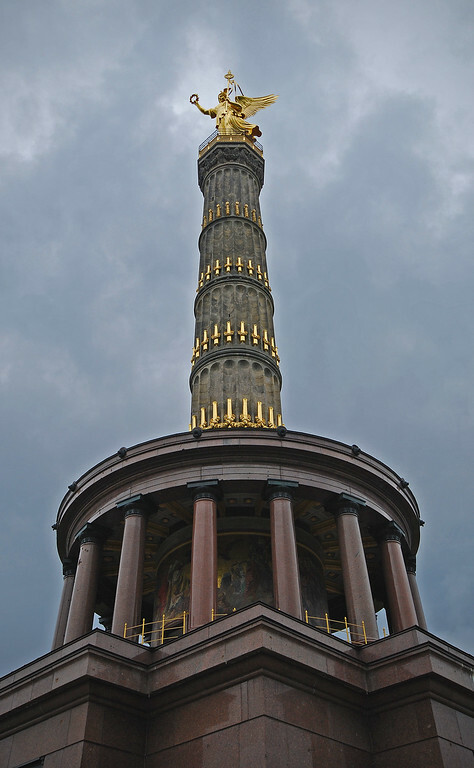 It may seem silly, but the Victory Column was one of my highlights of our trip to Berlin, partly because I was a fan of the film but mainly because it was one thing that hadn't changed from my memories of it so long ago. Speaking of which, Hollywood did a remake of "Der Himmel Uber Berlin". They took out everything that was good about the movie and turned it into an insipid romance called "City of Angels". Grrr..
Two years after the Soviets erected the wall, JFK came to Berlin and gave his famous speech proclaiming, "Ich bin ein Berliner!". Some of his detractors made fun of him pointing out that a Berliner is a nickname for a German jelly-filled pastry called a Pfannkuchen. But Kennedy had it right all along. They only call it a Berliner *outside* of Berlin. 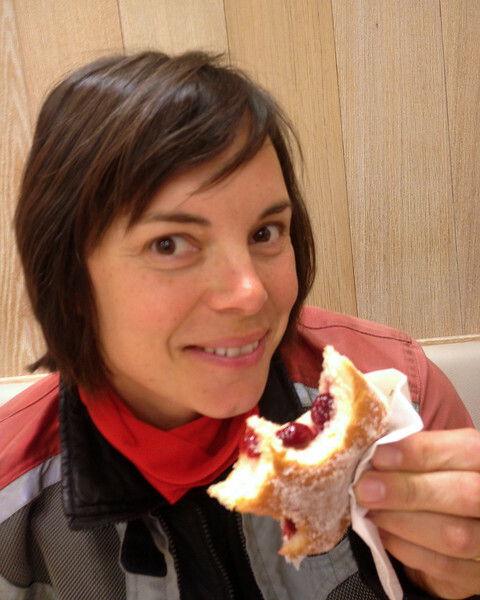 We downed a couple of Pfannkuchen in memory of JFK. 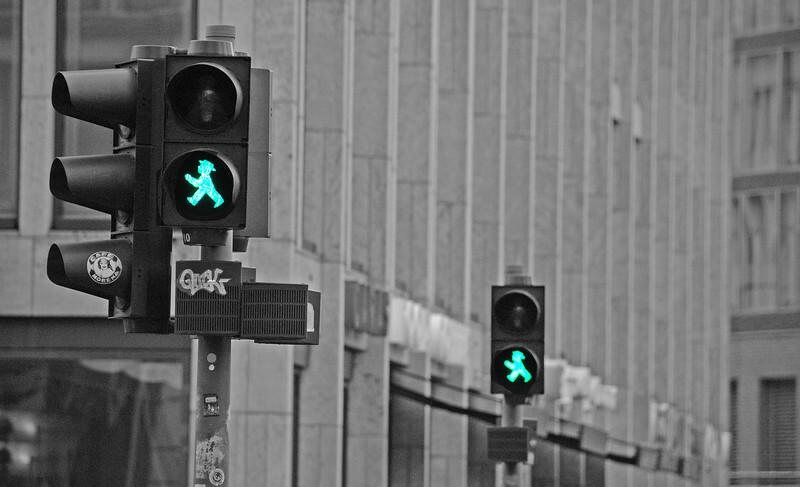 My fascination with Berlin is purely because I'm such a culture junkie. Neda's interest in this city is much more personal. 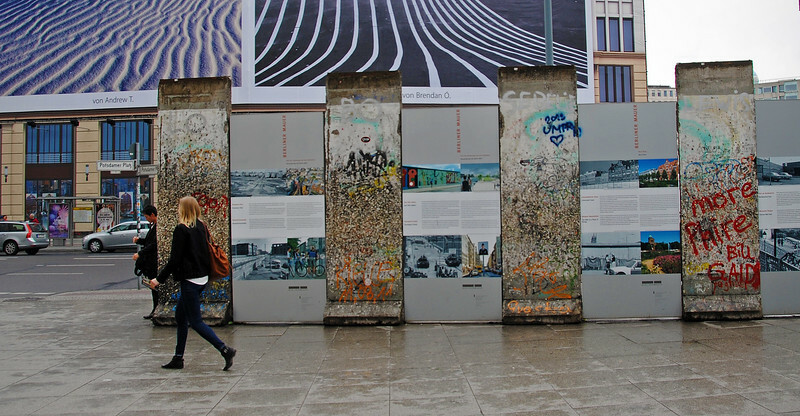 The crumbling of the Berlin Wall was the epicentre of a huge social, cultural and economic change in Europe. As East Germany abandoned the communist system and embraced western values, a ripple effect spread across all the Eastern Bloc countries. Neda was born in Yugoslavia. The echoes of the fall of the Berlin Wall fractured her country into many pieces, and Croatia rose from the rubble of communism. All of her childhood memories of Yugoslavia have been under this system of government, as she moved to Canada shortly after the war ended. So this trip to Berlin was a way of visiting the origin of where all this social change started. The first time I ever saw a Trabant was hanging 50 feet above the stage of a U2 concert. It was angled nose-down, with it's headlights shining down on the band like a spotlight: ZooTV. 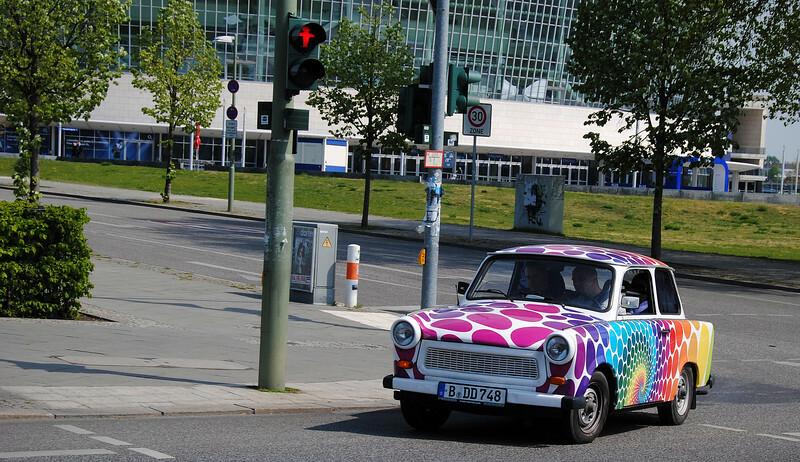 Regularly topping automotive lists as one of the world's worst cars ever made, the Trabant was an East German monstrosity that originally could not be bought from a showroom. East Germans had to order one and wait for them to be built and shipped to them. 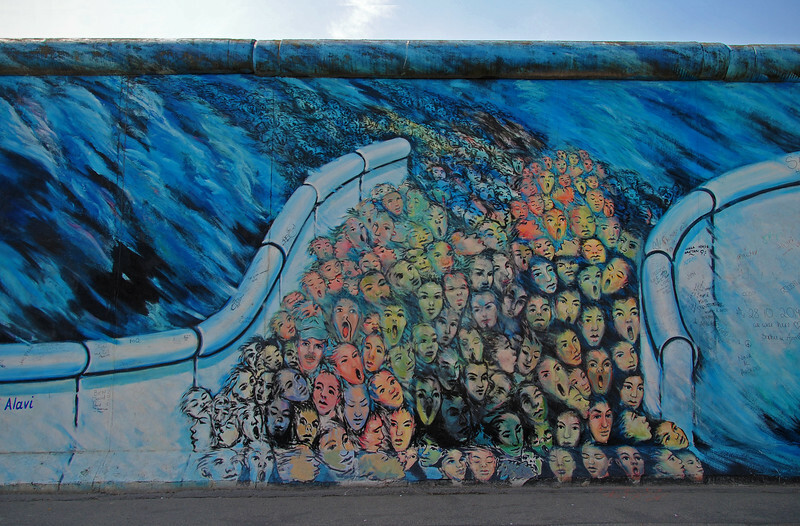 The East Side Gallery is a 1.3km stretch of the original Berlin Wall that features 105 works of art painted on the east side of the wall in 1990. There are so many great paintings here, but I've picked only a handful of them that really spoke to me. 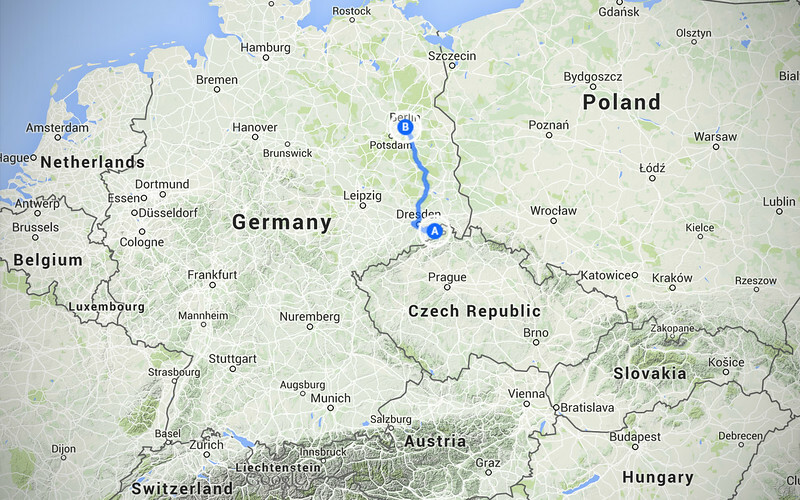 Between 1961 and 1989, eighty people died while trying to cross from East Germany to West Germany. 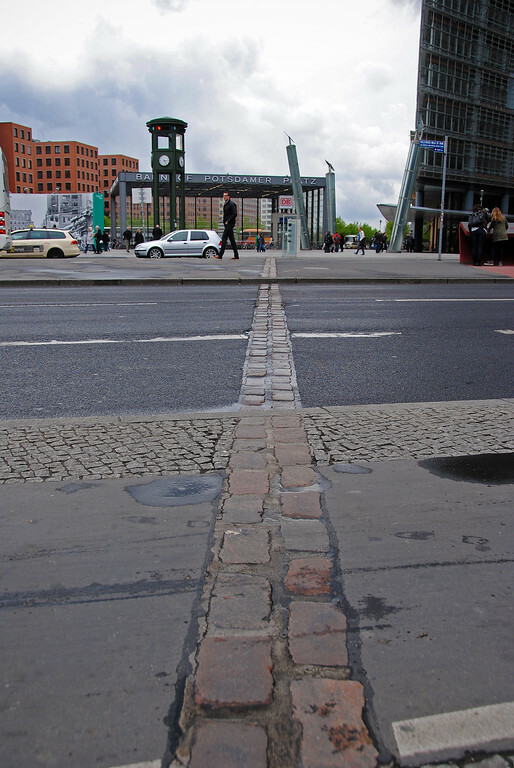 Before the wall was fully formed, East Berliners would regularly escape to the west via the west-ward facing windows of buildings that were right on the border. As the Soviets boarded up the lower-level windows, escapees lowered themselves via ropes or sheets, some of them died falling from higher stories. Later on, when the wall was fully erected, many more were killed by snipers at the watchtowers aiming at them as they crossed a specially built "kill-zone" that was lit up by floodlights at all hours of the night. 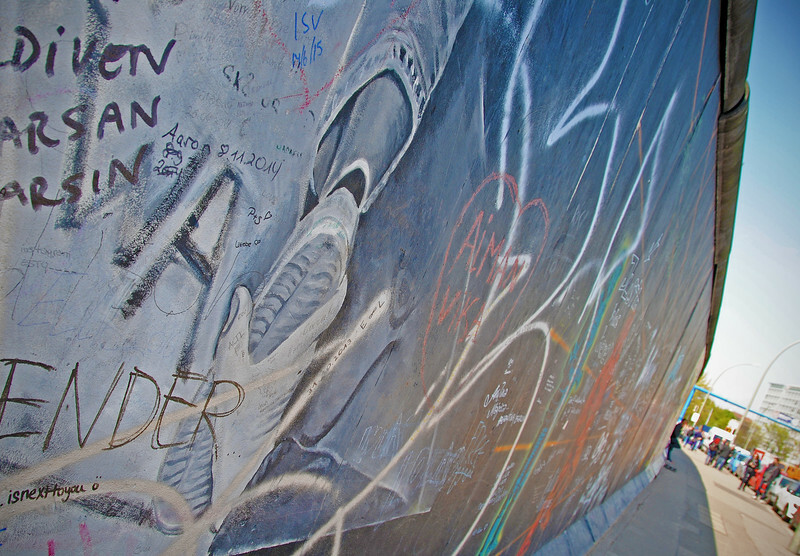 The west-side of the Wall is covered in graffiti. 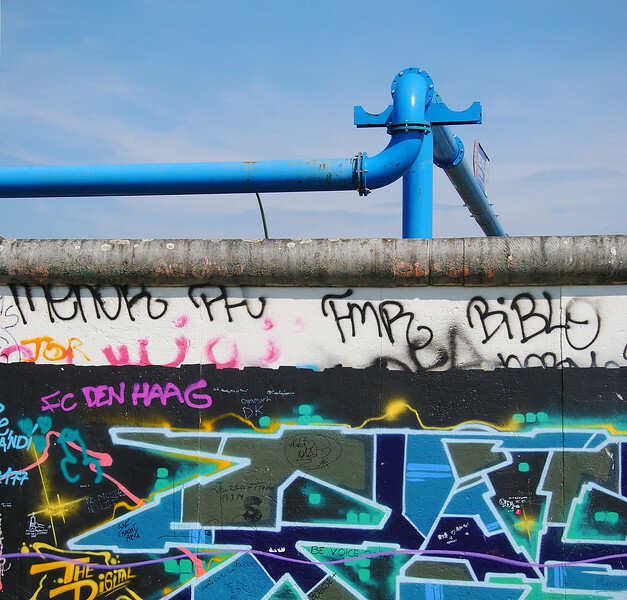 What the heck are all these blue pipes all over Berlin? While walking around the city, we saw blue and pink water pipes snaking all over the city. After some Internet-sleuthing, I discovered that these pipes are actually linked to the naming of the city. 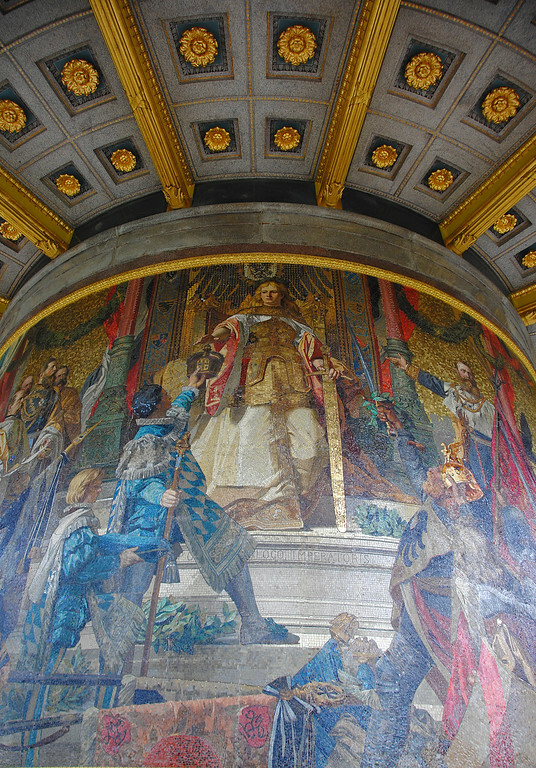 A lot of people think Berlin is named after the German word for "Bear", which is also on the city's coat of arms. 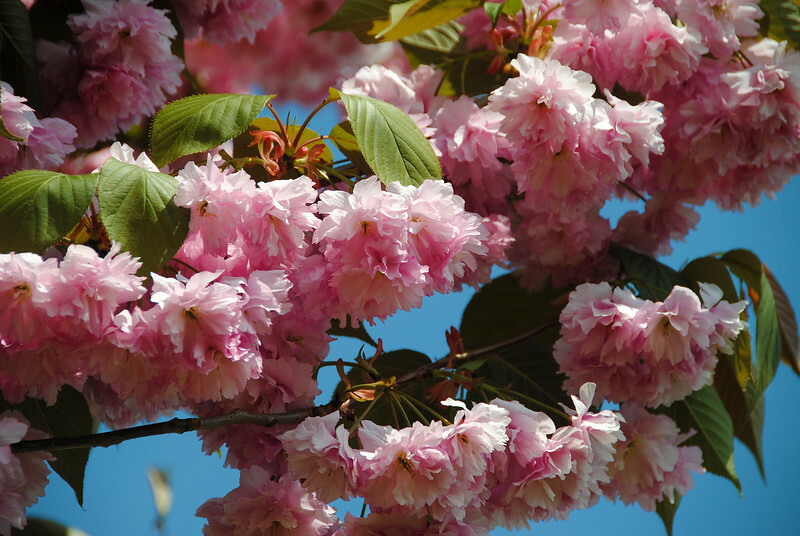 But the etymology of the word comes from an old Slavic word, "berl" which means "Swamp". Berlin is built on low-lying marshlands, literally it's a swamp. When buildings are constructed in Berlin, they use pipes to pump the water out of the construction site so they can put in the foundation. They've painted them all sorts of pastel colours to pretty it up, but these pipes are indirectly linked to the naming of the city! Neat, eh? Trying out some German Wurst! We rolled our motorcycles up on the sidewalk and nervously looked out for policemen as we chomped down on our currywurst. 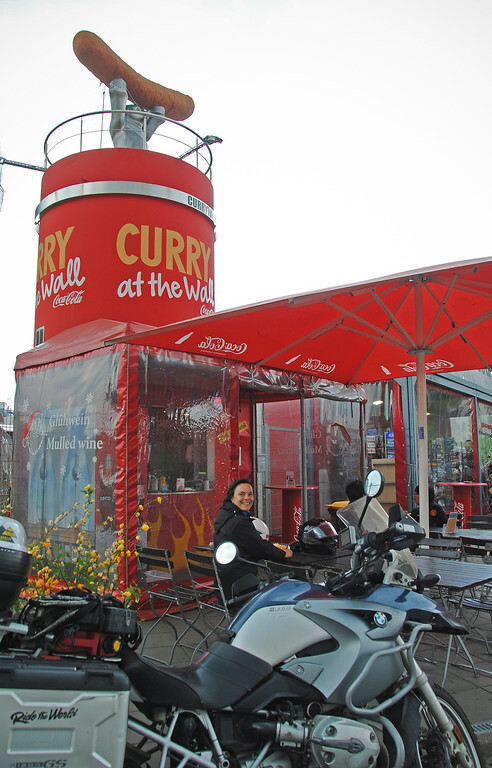 We were later told that this was not the best place to eat currywurst (true!) and that we didn't have to worry about getting ticketed as bikers get a free pass and can park just about anywhere they like in Berlin (sweet!). 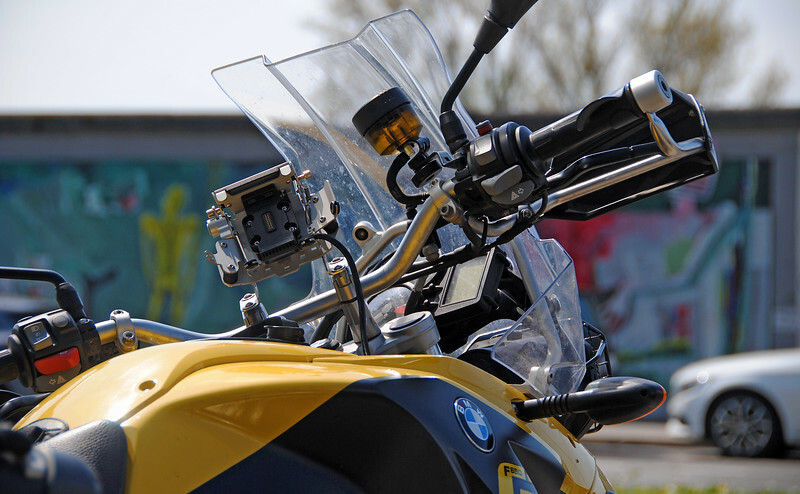 Even though the main headquarters for BMW is in Munich, the motorcycle factory is located in Berlin. So we *HAD* to visit the birthplace of our bikes. 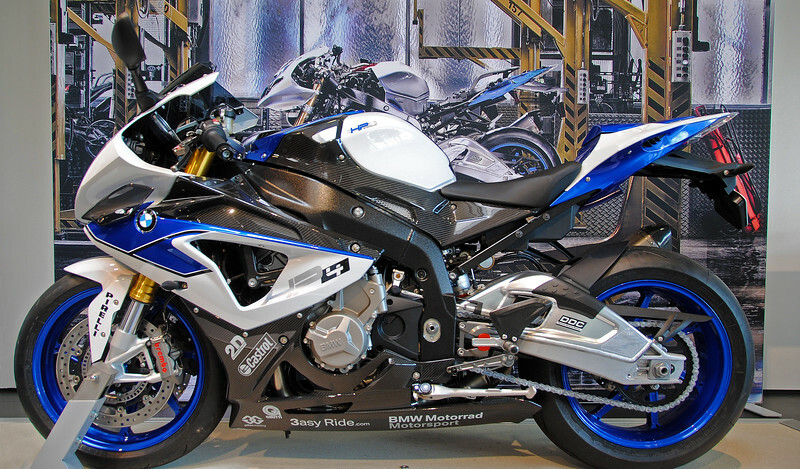 We weren't allowed to take any pictures of the plant, except for the showroom, but it was a fascinating tour where we got to see them assemble all sorts of bikes and see them get tested before they're shipped out. After the tour, he saw us hop on our Canadian-plated bikes. After finding out about our trip, he asked to take a picture with us and e-mailed us a copy! Great guy! 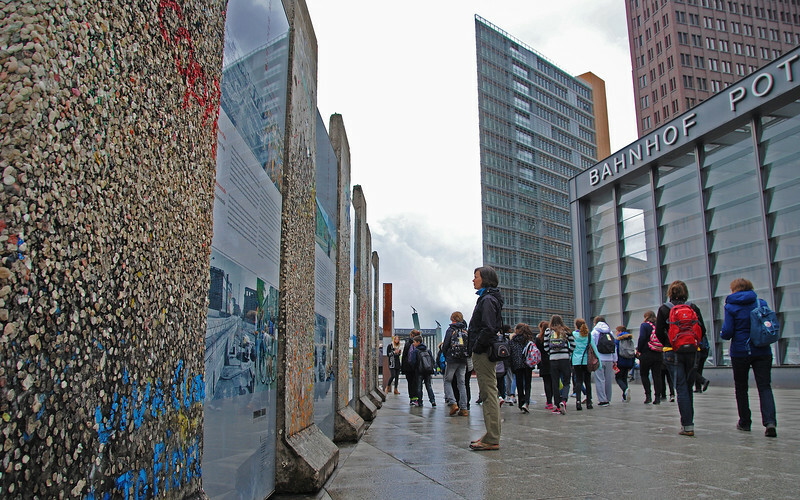 The fall of the Berlin Wall was one of most important historical events that happened in our time. We both have memories of it and were impacted in different ways by it. It was such a nostalgia trip riding and walking through the city and we both thoroughly enjoyed it!